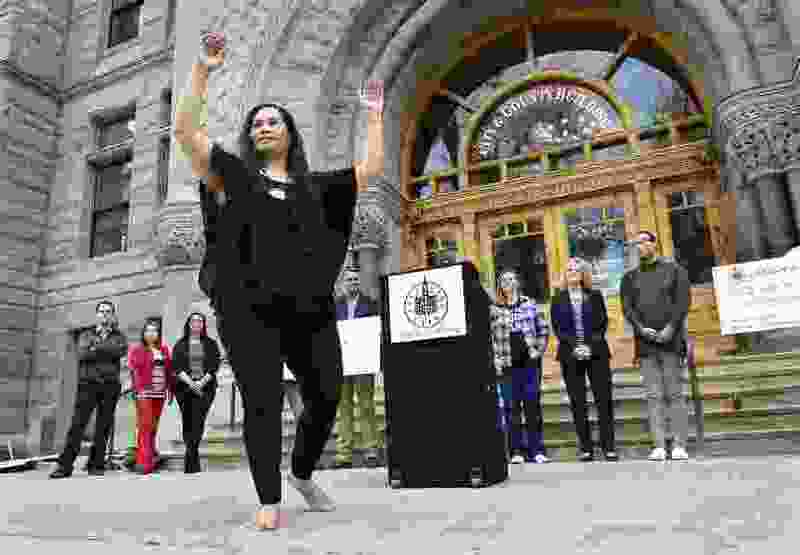 Scott Sommerdorf | The Salt Lake Tribune Oreta Tupol dances a Tahitian Aparima dance outside City Hall after Mayor Jackie Biskupski gave the Utah Pacific Island Heritage organization a $5,000 ACE grant, Wednesday, April 11, 2018. Salt Lake City is giving $200,000 to 79 organizations in 2018 to promote neighborhood and community arts and cultural events. The ACE grants are given to organizations that promote diversity, inclusion, cultural identity and economic development. Salt Lake City has awarded $200,000 to 79 organizations sponsoring arts and cultural events in the city this year — including street festivals, the Sugar House Farmers Market, a Bhutanese New Year celebration and Mexican Day of the Dead observance. The money comes from the mayor’s office Arts, Culture and Events (ACE) Fund. Since the fund began in 2012, the city has awarded around $170,000 a year to help “establish and grow unique events across the city,” according to the Mayor’s Office website. The grants support organizations that promote “diversity, inclusion, cultural identity, economic development and neighborhood unity” and that support the health and wellness of city residents. Mayor Jackie Biskupski presented a check to three recipients organizations — the Utah Pride Center, Hispanic Heritage Parade and Street Festival, and Utah Pacific Island Heritage Month — at a ceremony Wednesday that featured music and dance performances. Neighborhoods in Salt Lake City and the rest of the state are increasingly becoming more diverse, census data show. During this decade, the state saw the second-fastest growth rate for residents who speak a language other than English at home — a shift driven by the children of immigrants. And census estimates last year showed that Utah’s minority populations continue to be younger and grow faster than whites, with minorities accounting for 21 percent of the state’s population. The events the ACE grants support bring large numbers of people to the city and stimulates economic development, with the top nine recipients bringing in more than 400,000 people, according to the mayor’s office. Some of the largest events include the Utah Arts Festival, which brings in an annual 75,000 attendees; the Pride Festival, which brings in 60,000; and the Urban Arts Festival, which brings in 35,000. To be eligible for funding, an event must be held within city limits, be open to the public and further Salt Lake’s goals of promoting cultural diversity and financial development.